When I was a wee lass I wrote poems. It was a very big deal apparently because my first grade teacher--who did not love everyone-- loved me, because of my poems, i think. I would give them to her and she'd put a big fat scratch 'n sniff sticker on it and hang it on the wall for all to see. Big deal. I felt proud. 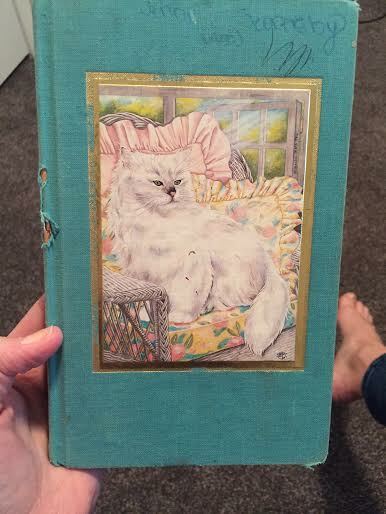 I think then, I thought white cats were the fanciest cats in the land. Because they are. Look at that creature sitting majestically on its wicker throne. 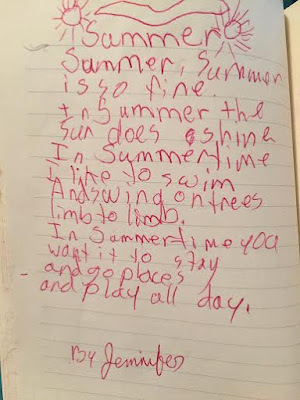 "Jennifers poem book! Touch this and die." I wrote in it a lot. Some were about the seasons or holidays, some about my family. They weren't all masterpieces but some weren't half bad. Especially when it's a day of rain. Integers, changing decimals to a fraction, and more. So I don't do it, and eat some toast. It's summertime, it's time to play!" Look at that. Something like twenty-six years ago to the day I wrote that poem and sure enough, I feel the same way now. As does Julian. 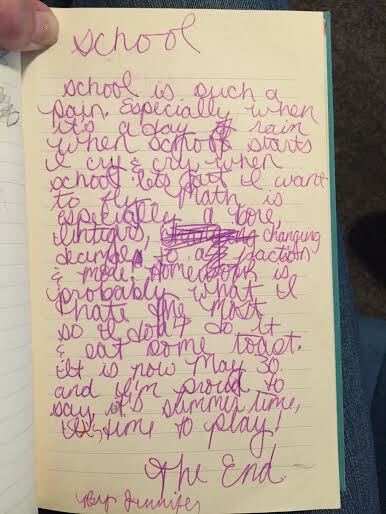 Kid does not love school. As a bonus I found one of the poems I'm most proud of it. It's so good I awarded myself the Newberry Award Medal which, I don't know if you know, is pretty prestigious. I made it huge for you so you're sure to catch everything. She bawls and whines all day. And she cries when she can't play. taps her on the head. She snores so loudly! and I almost lose my head. 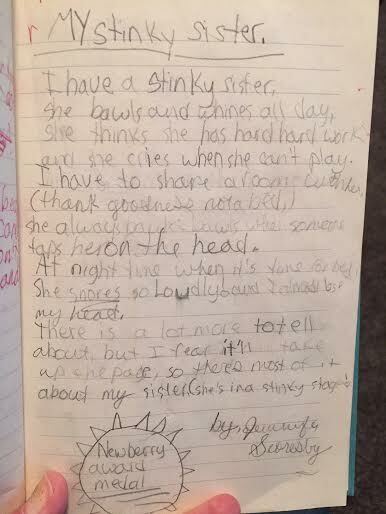 So there's most of it about my sister,(She's in a stinky stage). Wow. Just soak that in for a minute. Ha! That's just what I was thinking. 😏 Thanks for the comment! LOVE the poems. You totally captured the feeling of school vs summer. Thanks buddy. You don't smell as bad these days.. These poems are amazing. A regular Shel Silverstein. In my dreams! He was my favorite poet when I was a kid (obviously) and prob still is.